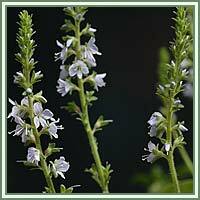 Description: Speedwell's leaves are simple, spiral shaped. Flowering occurs during early summer, from May to July. Flowers are blue, light lilac and irregular. Seeds are formed in september. History: Ancient Romans discovered Veronica during their conquest on Northern Europe, and named the plant „the world medicine”. Parts used: The plant during its blooming period (veronicae herba). Active compounds: Wax, organic acids, etheric oil, sugar, mannitol, tannin. 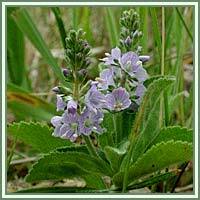 Medicinal use: Eases digestion and helps bowel movement, increases memory, reduces vertigo and has a calming effect. It has even shown to be very helpful in treatment of depression.